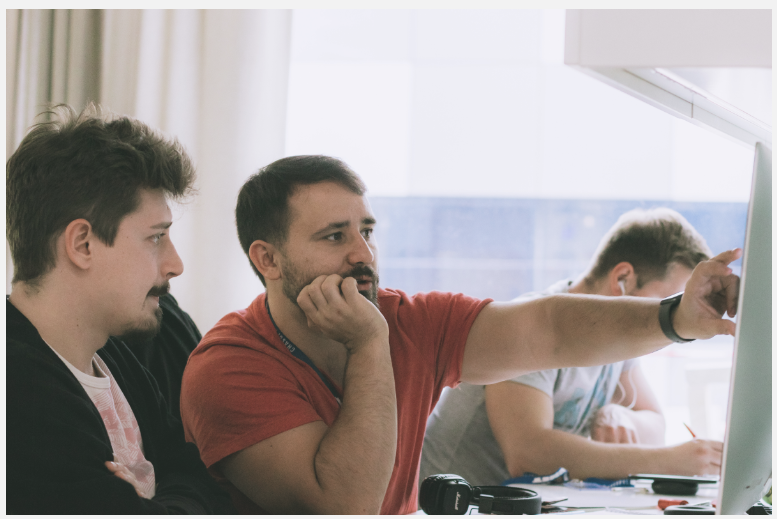 Today, we are talking to Andrii Horbachov and Dmytriy Kravchenko – the co-founders of Brave Wings digital bureau, UX\UI specialists from Ukraine. These guys have truly remarkable works in their portfolio, some of them can be found on Dribble, other projects cannot be shared in free access, due to contract restrictions, but believe me, they are even more interesting and complicated. Traditionallyб we discuss the business process of creative teams, issues and solutions. And, as you can see from the title, the guys have an answer for those, trying to find the best collaboration tool for UX\UI designers. Can you guess what would be the tool? I doubt it, but let us know in the comments below. Andrew. Tell me about your company – Brave Wings, and describe your business process set up. Andrii: Originally there were 2 of us, each person is in charge of, let’s say, one project and is responsible for the project implementation, communication with clients… Responsible for everything. At some point, we understood that we need more people to handle all the projects, and, with the team growing bigger, a manager. Consequently, we understood that we need a management procedure, as we faced the first process issues. For example, one of the pain points was the risk to lose a completed task, when it sent for approval. Internal Approval. Once the task is completed, it should be sent for approval. And not just sent and forgotten, but sent to the right person, aggregated, reviewed. This process should be as smooth as possible. Dmytriy : This is why we try to set the workflow explaining to the manager what he has to do. We have found a quick solution – Jira bot, which will send notifications to Slack whenever something appears in the “Task” column. The simplest thing we have worked out. Andrew. What do you use Jira for? Dmytriy .The main thing for us is time tracking, because our employees get paid by the hour, and we want to understand their workload. I mean, if someone works 5 hours per day, he is either underloaded or is simply fu*king around doing nothing. Andrew. And how do you count the hours? Do I press the button when I start and when I finish my work? Andrii. Yep, we rely on honesty, not on totalitarian watch. You take the task – you press the button, you finish the task – press it again. The program automatically collects the task name, divides it into days, and collects it all together. We have been looking for one simple tracking solution because Jira is not really good at it. But other solutions don’t have sprints which we use anyway, because they make everything easier to control. So, our only solution is Jira and Slack – we simply integrate them. Andrew. How does this bond with Slack? It’s interesting. Andrii. We just receive a message, a notification, basically, that the task has been started – it’s just an internal process. Andrew. Well, Jira doesn’t have any workflow automation, does it? Andrii. No, it has a workflow and its setup for a particular business process is very flexible. You can draw task schemes in there on the canvas. Plus, it has its own SlackBot, which can be integrated and set for triggers. The tasks, in fact, have 4 states: planned, in progress, testing, and completed. It is a basic set. But you can mess with them a little – sent for testing, testing in progress, etc. There are such things, but, generally, we are ok with basic pre-set. Andrew. Tell me about your business process. Dmytriy. It is important for us to find this balance between democracy, the process nerdiness, and simplicity of use without a loss in correctness. Andrew. What is the most problematic spot you are currently working on? I mean, something you haven’t fixed yet. And something you have already fixed, too. Dmytriy. Well, now it is approving process – I mean, getting confirmation that the tasks are completed. It’s all about how we build our workflow. We have our own… handbook of criteria which determine how we evaluate the tasks. The task itself is written strictly according to the framework, rules specified in out handbook. It includes some reference materials, that exactly should be completed, and the final target, aim that should be achieved. In fact, a manager needs to approve a completed task, he checks that everything is according to the procedure, even the name should be correct, not a copy-copy-copy x2. We actually built our process the way, that such basic things could be checked by any chap without any design experience. Our handbook has the checklist and explanation what it is about. Once task is completed, we – Art-direction, get notification, check everything, give feedback or approve it. Andrii. If we give feedback, the project has to be revised and go through the full cycle again. This is the process that we are trying to build at the moment. As for the problems it resolves… You know, there are people who try to pass the information verbally. We call it fast-food style, like a guy behind the counter who calls out that the order is ready, next one please. We fight with this approach, as having no centralized channel to track all the progress brings to misunderstandings and pauses the working process. Just like today, we had a situation on a daily meeting. – It was completed yesterday! – And where’s the approval? – I thought it was approved. Dmytriy.That’s it, everything that is not recorded in the system makes pauses the process and brings to the delays, just like that. Andrew. It is important to avoid automatic responsibility transition: I’ve completed my part, told someone about that, and that’s it – I am no longer responsible for that task. People don’t understand that there is no such thing: “If I am done – this project is done, too”. It’s not like passing the shifts, you know. Dmytriy. Globally, this is a problem in the personal approach, employees should not strive to complete the task, move it forward on the kanban and forget about it. They are not “task-solvers.” Our people should understand that their task is to resolve our client’s problem, not to move task on the board. And that’s what we are trying to change in people’s minds. Andrew: That’s true, but I doubt that it can be resolved with the help of software or project management tool. Dmytriy. Yes, but this is the manager’s task – to build up a real team and organize the business process in the most efficient way, and use the right software solution, if you need one. Plus, we involve our guys into the project a bit deeper, then it is necessary. Andrew. I guess this is the matter of personal interest in the overall project result. Andrii. But we don’t limit the process with just sending the release notes. We always have an obligation for manager and developer to demonstrate everything by themselves. It’s a perfect case because, in such situation, we can provide a better description of what we have done and process client’s comments more efficiently. In this case, it’s enough to have the release notes mentioned above. However, if manager presents the work on his own, without the developer, he must have a presentation plan and recommendations from a person, who has worked on a task. Thus, we get the additional work for the task executor to prepare an explicit text report with the description of every taken step and the outcomes. Dmytriy. Iin any case, everything is recorded, and one way or another, It gives us a possibility to version all the work. I mean, we have all operations and all undertaken actions recorded. We can simply go back and check in retrospective what was done and how. It is convenient for a client. It is convenient for us, as we can understand all the changes better. True. Not only changes, but the whole process. Andrew.Basically, your process foresees something, that we call a timeline in Approval Studio, and during the presentation you give the customer something we call Proof Report, however while in Approval Studio system generates it for us, your team prepares those manually. Andrii. You know, it’s very important to track expenses, progress and efficiency of the project. If the progress is not recorded, that you have a big chance to miss that you are legging behind. If you pass all the information verbally, you can’t track the overall progress – all you hear “That was done. And that was done.” But you can’t see the whole picture, and can’t track where and why you get behind the schedule. Dmytriy. The worst scenario for small companies, not rock-stars, who have a small paycheck with a fixed price is activity imitation. All that verbal communication turns your work into visibility of work, and it easily throws you of your budget. If you have a timing material – screw it, client pays anyway, but you can’t allow yourself such things when you work on fixed price. Andrii. Sooner or later you face the situation where you have nothing to pay with to your team. Andrew. One of the guys I had an interview with, told me that the smallest pause costs quite a lot of money. Andrii. If you are on fixed price, each 15-minute holdup will result in 10-16-20 hours of a dead time for the project. Dmytriy. (Small reminder here, Brave Wings are in Ukraine, and have GMT+2 time zone, while East Coast has GMT-5 and West Coast is on GMT-8),). It’s not only about the accumulated time. The majority of our clients are in US, so all the communication happens in the evening for us – morning for them. If, for some reason, we missed some message from the client, or did not figure out what we need to do, we have a whole day of a dead time. Which means that we lose something – a deadline, a workload, etc. Thus, the absence of processes kills everything. Communications issues cost a lot for us. Andrew. I remember working with an outsource team, we built up almost 24 hours development process. Every day, at 9AM New York time US and EU teams had a meeting where they passed the information about the progress to each other. They had an hour to work together, to figure everything up, so when one team was leaving, the second one was able to pick up and continue working. Andrii. You should understand, that even in one team the approval process is different for the guys who are in the office and for those, working remotely. If all of us are in the office, we can team up and discuss what’s wrong with the mock up face-to-face. While working in the Canada, where ALL the team members were working remotely, we had non-stop Skype calls, and believe me, it’s inconvenient and irritating. Our company was in the middle of implementing… developing their own tool. You could upload the layout, tap on it, create a comment, add an annotation to it, and mark as resolved. For example, if something wrong with the logo, you could have a discussing in there, then the responsible person would update the layout, generates a new version, and would resolve the previous annotation. I don’t think that they solution would ever be released, but the idea was great. And I should say, it was really comfortable to work with this app. Andrew. I should say, that we in Approval Studio have all the features that you mentioned – on-pic annotations, versioning, ability to resolve comments. But, of course, the editor itself is not built-in. Andrii. As I said, that tool was an internal solution, so we had to find something to substitute that app. We currently use a tool, that makes a screenshot, allows to annotate and share it in Slack. Of course, not that reach functionality but easy to use, Teampaper Snap – you might have heard about it. But what I liked about that custom tool we had, was versioning. At any moment you could jump to some older version and check what was in there. Dmytriy. Version history, versioning in a must-have functionality in the tools of the kind. You don’t use it very often, but when you really need it – you can sell a soul for it. Dmytriy. Well. Let me tell you this way, when you spend six hours working on the file and need to jump back to some previous decision… While I was working with Photoshop, I was doing the numerous copies, basically on every milestone. And you need to save all this somewhere, with new name for every file. Andrii. However, we found the ideal solution for UI\UX here. We resolved all these problems, with the help of Figma and Dropbox, that fits best for mockups. Figma – is a collaborative UX design tool. An ideal tool for big projects and art-direction, as for me. in addition, it has internal annotations, versioning, and mockups online collaboration tool. We tried to work on a project with a 4 people team simultaneously, and it was ok. But again, this is for our internal processes, not for clients. Yes, it has some demerits, like slow load time, especially with numerous mockups, but again, no one is ideal. That tool became a real solution for us as UI designers. They actually focused on UI\UX and, I think, did a great job. Dmytriy. Of course, it cannot substitute the Photoshop or Illustrator, but to work on the mockups… I can’t find anything better. At this moment our conversation switched to Approval Studio functionality discussion, and we traditionally skip this part. For those, who decided that the answer to the question post in the header of the Interview – surprise. We are not trying to promote just our product in the blog. We share the experience of the professionals in the design sphere, their issues, their solutions. I hope this conversation was interesting for you, and if you want to talk to the guys from Brave Wings personally, feel free to contact them here https://bravewings.io/ Also contact Approval Studio team to share your professional opinion with us and the blog readers.